The setting is a small Ukrainian town during the Second World War, a place where the many Jewish inhabitants are preparing for the worst. As the German occupying troops slowly begin to empty the town of Jews, parents attempt to smuggle their children into the mountains, where, hidden with peasant families, they will be relatively safe. 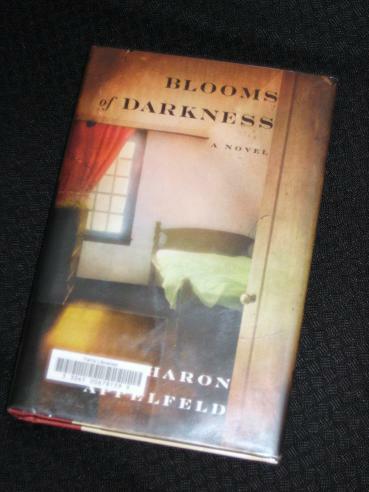 The majority of Blooms of Darkness is spent with Hugo, either in his cupboard or in Mariana’s room, and this lends the book the claustrophobic atmosphere I mentioned at the start of the post. Hugo initially sees Mariana as a sort of ersatz mother, but the longer he stays, the more the relationship changes, the unreal isolation corrupting their feelings for each other. This relationship between Hugo and Mariana will probably cause problems for many readers of Blooms of Darkness, and rightly so. It’s thoroughly plausible, and the more we learn about Mariana (her alcoholism, her terrible childhood) and the terrifying environment the two of them are existing in, the more we understand why and how things turn out the way they do. Mariana, although physically a woman, is just as immature as Hugo. However, it’s still disturbing, and were the genders to be reversed, there would probably be a lot of very angry readers. My main issue with the book is very different though. In short, it’s incredibly dull. I know it’s not the done thing to criticise anything connected to the holocaust, but this really has little to recommend it. It’s a doughy mish-mash of various ideas and stories (the tart with a heart, the cupboard of The Diary of Anne Frank, a doomed attempt to flee, reminiscent of Tess of the D’Urbervilles) which left me wondering what it was really all about. In short then, not one I’d recommend. There are a million books out there describing the atrocities of the wars in Europe, and while Blooms of Darkness does take the reader into a relatively under-described region, there’s nothing in the novel which makes it stand out amongst its peers and competitors. Erm, sorry, not this one. It’s not terrible, but I’ve read too many better books recently. The translation isn’t bad, and any limitations in the language are probably due to the original style. There are some moving moments towards the end of the book, but it would be very hard not to have any in a book with this setting. There just isn’t enough there for me. Probably not. There will be people who like this, for the setting, the unfolding relationship between Hugo and Mariana and the melodramatic end. I can’t see the judges elevating this above many of the other longlisted titles though; it’s too average. That’s all for today 🙂 Join me for the next leg of the journey, when we’ll be hitting Paris – Vive la différence! Paris is good, Have finished Scenes from village life & enjoyed that.This is one of those strange tales where as you say if the genders were reversed there would be outcry. Too bad it didn't work for you. I have still high hopes for my first Applefeld later this year. I can't remember the title right now. Gary – Sometimes equality is a bit of myth… If this had been the relationship between a young girl and an older man, it would never have been published. Hmm, I'm still not at all convinced about the plausibility of the central relationship. If the boy was fifteen or so, then perhaps. But eleven/twelve? I can't see it. It's nothing to do with being prudish, I just don't think it would happen, not even in this extraordinary context. Well yes, she obviously initiated it, and I doubt he even knew what was happening.